This would looks great in everyone’s music production studio ! 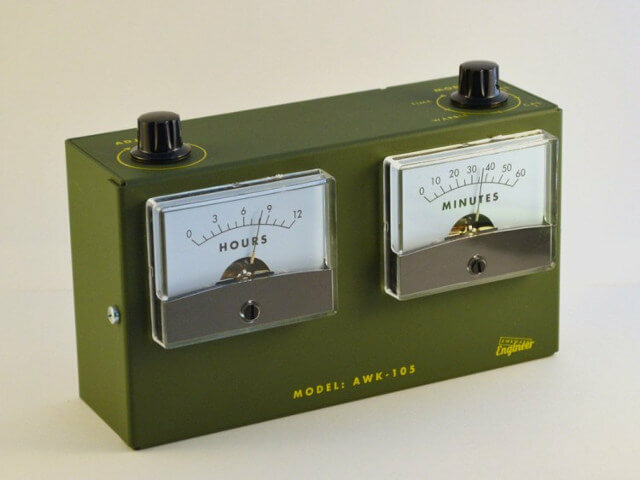 The Voltmeter Clock uses dual analog meters to tell time – one for hours and and one for minutes. It’s both stylish and functional! Think of the Clock as replacing digital LCD’s with analog readouts. Instead of seeing 04:57, the hours meter will point to the 4 and the minutes meter will point to 57. Just like a clock rolls over at midnight and noon, the time meters rolls over zero. At Awkward Engineer, we love geeking out over the technical stuff. Here’s some of the details of what the Clock is made of. Use discount code PRESALE to get 30% off at checkout. This is a presale discount only and only available while we’re building the next batch. Can we guarantee that the presale will ship by Christmas? No, but we’re trying like hell to get them back in stock. January is a good bet for shipping.